When one thinks of a Japanese family, what usually comes to mind is the image of a male breadwinner household, in which the father is mostly absent from home and busy working long hours, while his wife stays at home and takes care of the housework and children. This family model and division of gender roles continues to be seen by most as traditional, and even as the cultural norm of the country. However, as in other developed countries, Japan has been undergoing tremendous changes, and an increasing number of people of both sexes reject this model – specialists even argue there is nothing culturally Japanese about the male breadwinner household: for instance, as Atsuko Suzuki’s work shows, women used to be massively employed in agriculture, and the percentage of housewives never went over its all-time peak at 37.1% in 1980. A survey performed by the Gender Equality Bureau of Japan is a case in point of this change: to the statement that the “husband is expected to work outside the home, while [the] wife is expected to take on domestic duties”, over 70% of respondents agreed in 1979, but thirty years later, in 2009, more than half the population was against the stereotypical statement (55.1%), and for the first time in the history of this survey, the number of men who disagreed outnumbered that of those who supported it (51.1% against, 45.8% supporting). While the case of career-women who focus on work and do not wish to marry, have children and become housewives is quite famous, less known is that of fathers who want to take part in their children’s education; yet, the latter has been gaining more and more attention. I wrote my Master’s thesis on this issue, performing researches and interviews to this end, and this article is based on it. Originally, this trend was mostly limited to rare activist groups – like Otoko mo onna mo ikuji jikan o! Renraku kai (Childcare Hours for Men and Women! Network, also known as Ikujiren) created in 1980, and famous for sending a public letter to British Prime Minister Tony Blair in 2000, to induce him to take childcare leave when his baby was born – but they paved the way for the actual boom of the movement around 2005-2006. Around this time, magazines dedicated to fathering like Nikkei Kids or FQ Japan were founded, as well as new associations, which gained momentum in the media and people’s minds, like Fathering Japan. The latter launched the papa kentei, or Fathering proficiency test, a quiz fathers can take for fun to judge their knowledge on childcare and raise awareness on the matter, gathering about ten thousand participants for its first edition in 2008; its quiz form was decided upon because, as the founder Tetsuya Ando told me himself: “Japanese people love quizzes and exams!”. This development entailed the creation of the buzzword ikumen, which was made up by the advertising Agency Hakuhodo, according to Tetsuya Ando. It is made out of the words “iku” (“raise children” in Japanese) and “men” (in English), but one can also see a pun with the word “ikemen” (“handsome man” in Japanese), in order to make it sound positive to Japanese people. Why make it sound positive? With the young generations increasingly rejecting the old male breadwinner model and the birth-rates now one of the lowest in the world, the latest solution found by the government to tackle the issue has been to try and support this ikumen trend, in hope it would help families have more children: figures indeed show that families in which fathers are significantly more invested tend to have more children. It has multiplied campaigns since the early 2000s, and the latest revision of the Childcare and Family Care Leave Law in 2009 insists on the necessity for fathers to take better part in childcare by allowing both parents to share childcare leave – though its results are quite mixed so far. As one who knows about the “workaholic” Japanese society can assume, a lot of men declare they do not spend more time with their wives and children for lack of family-friendly policies within their firms, and spend most of their time at work. According to a survey by the Dai-ichi Life Research Institute in 2004 (reported by Jihe Be), only 23.5% of respondents could get flexible hours for their families, and while 44% left home before 7:30 am, 46% came back home after 9 pm. Tetsuya Ando playfully noted to me that more than work-life balance, Japan is about “work-work balance”. However, the same research institute showed that about 60% of men did not feel a work-family conflict, while declaring that being a father was their most important role. What this means is that for many Japanese men, fulfilling one’s role as a father equals being successful professionally and providing for their families; I even met an ikuman who claimed the same, while acknowledging it was a rather old-fashioned way of thinking. As stated by Gordon Matthew in 2003, working hard also remains a form of pride and an expression of strong masculinity, but the economic slowdown has been dampening this trend, as the state of Japan has worsened in spite of those workers’ efforts. It is rare to find a Japanese man under 45 years old claiming that he lives for work, while on the contrary older men with higher ranks tend to be more conservative. Younger men are torn between, on the one hand, the absence of official (media or government) encouragement to sacrifice one’s life to one’s company – and those young men tend to agree that this is not desirable – and on the other hand, their older colleagues, in front of whom they have to stay longer at work to appear as worthy workers. Add that to the fact those young workers are at the age when they usually have children, and the core of their dilemma is set. Cases of fathers bullied or fired for taking time off for their families regularly appear in the media, and they clearly send a message to fathers that it is a risky thing to do. As a study by the Human Renaissance Institute shows, many are reluctant to do even seemingly easy things, like bringing their child to a daycare center: what if there was a problem and they ended up being late at work? Potentially bad repercussions on their careers and the fear of their peers’ opinion often keep them from even trying. As Masako Ishii-Kuntz puts it, the salary gap between men and women is still so wide, that it usually makes more sense within couples for the wife to be the one to reduce her workload; some ikumen I met expressed the same problem: they often literally cannot afford to do otherwise. Most would not dare be the first employee in the company to ask to take time off for his family, especially when it comes to childcare leave. The good news, however, is that when there is a precedent, it is an incentive for others – often for them to even realize a man can take care of his children too. For instance, when for the first time ever the mayor of a Japanese city took childcare leave after the birth of his child, his example was followed by four others within the same year. In general though, more than childcare leave, most men say they would rather go home early regularly for their children. A lot of men also claim they give up on childcare because they do not know how to do it; the idea that women are naturally gifted for it still prevails in the general opinion – it should also be highlighted that traditionally, a lot of mothers go back for a month to their parents’ with their new born to learn how to take care of them, and it is still quite common to do so; this early isolation of the father is not the best incentive to encourage him to do his share, and it is precisely this sort of reason that leads associations like Fathering Japan to hold seminars or meetings to inform fathers, while magazines targeting fathers also provide advice and can be found at “strategic” places, like hospitals or daycare centers. As some of my interviewees like Mr Asano highlight, the rise of ikumen occurs in the Tokai region, and especially in big cities like Tokyo or Osaka: in the countryside, tradition still prevails. The ie – literally “house” – refers to the old family system in which 3 generations live together and the eldest son plays a major role, while his wife has to abide by her parents-in-law’s orders. Having the grandparents around could mean more people available to take care of the children, but as a study by Scott North in Toyama prefecture in 2009 shows, in old ie configuration households, women actually spend more time dealing with childcare on their own: the influence of traditional values, peer pressure and gender division remain strong. On the contrary, in urban regions, studies show that grandparents of dual income parents can be a great help for childcare, including the grandfather who may not have been present for his children, but has time after retirement for his grandchildren. With the decline of the male breadwinner model and the rising influence of feminism, an increasing number of women refuse to bear the weight of childcare and domestic chores all by themselves, and it forces men to rethink their place in the household, as shown by interviews by the Human Research Institute. Fathering Japan members pointed out to me how feedback and questions they receive about fathering are usually the initiative of women, rather than men: wives contact them, go to seminars, find fathering documentation and inform their husbands about it; some of my interviewees also explained they had joined the association after hearing about it from a woman in their entourage. I was even told that many wives trick their husbands into bringing them to seminars and meetings by telling them it is a “family event”, and once at the location, they pretext an errand to leave their husbands with their children at the event, to force them into thinking and trying to do some childcare. It can also be noted that women are increasingly present in the media, and those sensitive to the issue advertise fathering and organizations related to it. Women can sometimes prevent men from taking an active part in childcare in the way that, as Tetsuya Ando puts it, many feel taking care of children is their sole responsibility. According to the Gender Equality Bureau survey mentioned above, it can be noted that in 2009, nearly 40% of women agreed that the “husband is expected to work outside the home, while [the] wife is expected to take on domestic duties”. Though they do not represent the majority anymore, a great number of them still assume couples shouldn’t share those tasks, and as Schoppa demonstrates, many are content with being housewives. One of my interviewees pointed out that the expectation of mothers towards their sons and daughters are still often different as well, as more pressure is put on sons to succeed at school in order to obtain a good career, which helps perpetuating the male breadwinner scheme. Moreover, according to Matthew, some men admit their families are far from being a place of acceptance and peace out of work, as they have to perform what he calls “family service”: their wives are less likely than older women to accept a family model where the father is absent, and they pressure them into doing activities with the family on week-ends, as they have no time during the week; the husbands often do not do them out of enjoyment, but out of duty, which entails much stress for them. Therefore, to Matthew, Japanese men are placed into an ironic situation, as “the progressive Japanese cultural ideal of men living for their families seems to have become not a source of fulfillment for men but a source of pressure”. One should point out that the exact meaning of this word is actually a bit hazy in people’s minds: several of my interviewees highlighted how Japanese people often mistakenly assume an ikuman is a father who takes a long childcare leave of absence, or a househusband, while it more generally refers to a father who simply wants to take part in his children’s lives, sometimes without even taking childcare leave: many ikumen simply go home early on a regular basis. A lot of the men who decide to take on this rather unusual path claim that they followed their wives’ incentive, or that they were made aware of fathering through external sources like associations. Some also do it because they think it is important to give an alternative to the mother’s environment: to them, it is about going further than simply “helping the mother”, since there is no reason a father could not do as much. I also met people who highlighted how they did not want to repeat their own experience with their fathers – or lack thereof – since the latter were usually absent from home during their childhood; in the worse cases, their fathers would bring home the authoritative spirit they needed at work: on the contrary, those new fathers want a harmonious bond with their own children. Playing an active role in childcare has of course positive outcomes for fathers and their families, the first of which being the fact that they get to spend time with their children and develop close relationships with them. A lot of ikumen also claim it makes them understand better what most women go through regarding childcare when they are left alone with children, and they feel they gain patience and skills from the experience. They also all agree it improves their relationships with their wives, and communications within couples and families. However, those men also have their share of issues when taking the childcare road. “Why you and not your wife?” is a recurrent question ikumen have to face on a daily basis: most talk about the incomprehension they stir up, especially from their colleagues, when they express their desire to go home or take time off for their families. They also face what I mentioned prevents a lot of men from even trying to deal with childcare: job insecurity. They have to miss on overtime or traditional “male bonding rituals” (nomikai) which can impede their careers. Depending on their cases, they find different ways to deal with it: M. Ishii-Kuntz mentions for instance Mr Takenaka, who took a difficult exam to stop being belittled by his colleagues for leaving at the same time as female employees – shameful indeed. Mr Wada whom I interviewed, explained that he got in trouble for not working overtime after his daughter was born, which led him to quit his job entirely; his colleagues were jealous of him, and his superiors never understood his decision. When they decide to take a full childcare leave, ikumen try to minimize the inconvenience caused to their workplace by taking a rather short one – they only very rarely take one or two months off – but they still surprise people around them by doing so, sometimes even starting with their own wives. The Human Research Institute tells the stories of many of those men who were extremely worried about asking for such a leave, and coming back to work after it, and how the support of their peers is very important to them: many around them misunderstand their point, and assume they will go on vacations. M. Ishii-Kuntz says that this support depends on the family-friendliness of their firm, whether there are precedents and the female ratio at work; but the current recession is not really in favor of this trend. Once on leave, a lot of them feel like they do not fit in: for instance, when a man is seen on the street in the middle of a working day, people assume it is his day off or he is unemployed, and if he is with his children, they assume he is a househusband; but the idea that he may be on childcare leave is extremely rare: according to the Gender Equality Bureau, only 2.6% of fathers took childcare leave in 2011 – twice as many as in 2010! – while 87.8% of mothers did. It is hard for those fathers to be seen as the one responsible for their children, and they sometimes say they feel quite lonely and have a hard time relating to others: Mr Wada for example, explained that when he took his child to play in the park, since he was the only father around, he felt like an outsider, ostracized from the group of mothers who came at the same time. Many ikumen found themselves in this situation, and also worried it could impact badly on their children’s relations to others, for being the one with the “different” father. M. Ishii-Kuntz says that while women can have roles that are both traditionally feminine (childcare) and masculine (work), it is much harder for men, especially regarding childcare leave: they cannot associate with full-time housewives, and they long for interactions with other fathers; they sometimes join gatherings and associations just for that. More and more fathers claim they want to at least help with childcare, especially when their wives decide to keep on working after giving birth. According to interviews, the common pattern for those dual income couples is to share daycare tasks according to each parent’s schedule: one brings the children in the morning, and the other picks them up in the evening; the father is more often the one in charge in the morning, so that he can work overtime if necessary. Daycare centers allow both parents the possibility to work, but also to meet other parents in the same situation as them. 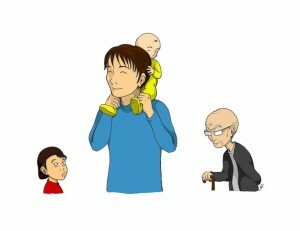 As for fathers, by coming to daycare centers, they also encourage more men to do the same: for instance, Mr Wada explained that when he started bringing his child to his daycare center, only a handful of other fathers did, but mothers told him they were asking their own husbands to be more like him, and progressively more and more came in to take part in the process. Conversely, the system also has flaws, the first of which being the continuous deficit of slots in daycare centers: whether government-subsidized or private, the number of facilities is greatly insufficient, and parents often struggle to find an opening – according to the Japan Times, about 25,000 children were on authorized centers waiting lists in 2012, but the real figure may be actually twice as high. Those who do manage to place their children have to face hectic days: in the morning, parents have to remember to bring diapers, changes of clothes, clean dishes and to take their child’s temperature. In the evening, those who do not have fixed hours can be scolded by daycare center employees for being late. If their child is ill, one parent has to leave work to take care of them, which can have a negative influence on their work, and services to help in those situations are scarce. The relation Japanese men have with childcare is evolving: for older generations, being a father mainly meant being the breadwinner and providing for one’s family; but for younger ones, the model of the father absent from the home has less and less appeal, as men want to be more present in the lives of their children. Authors and interviewees agree that it is nowadays positive for a man to want to be an ikuman, that more men want to play a role in childcare, and that it has become easier for them to do so. However, the weight of corporate traditions, as well as those of the countryside, added to general assumptions on gender roles, curb the evolution towards more involvement in childcare for men. Yet, some other factors are on the contrary helping this evolution: some still rare men stand up against corporate traditions and fight for their rights to take part in childcare, and women can – consciously or not – hinder this evolution at times, but also greatly boost it. The government can also play an important role, but their attempts to raise awareness on fathering have yet to show concrete results. Lucie has masters degrees in Political Sciences and Contemporary Asian Studies from the Institute of Political Studies in Lyon, France. Gender issues is her primary interest; she wrote her master’s thesis on the subject of ikumen, using both academic literature and interviews with members of “Fathering Japan” and others related to the movement. Currently she works in the video game industry in Osaka. Pingback: Childcare not the only cost for working women in Japan | Your Child Feels Best!